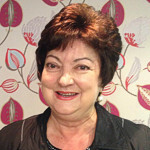 Maria McDougall | The Society of Women Writers NSW Inc.
Maria McDougall has written numerous educational programs, reports and procedures along with plays, skits and jingles for children’s performance items on the school stage. For many years she taught in NSW State Schools and was a mentor to countless student teachers from Macquarie University. She also taught and supervised TAFE students in their Child Care Certificate Course and wrote many reports and observations. She has written essays and analytical texts on the study of women and their role in Renaissance art and literature. She is presently working on her memoir and is writing an information book for children.